Tested Working onsite, unit is fully functional. Includes unit only, no power cable, or other accessories. Unit has wear from previous use, including scuffs, scratches and blemishes. Unit is on hand and ready to ship!. 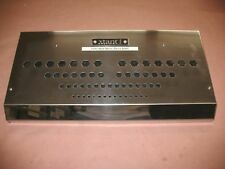 Classic Xtant 6.1 Mono Subwoofer Car Audio Amplifier 600w RMS @ 2Ω as pictured. It was also considered the best on the market back then. Modular Expansion Port: Used for docking Xtant's signal processors. 1000 Watt Class D Mono Amplifier. Input Sensitvity: 100mV - 8.5V RMS Unbalanced / 100mV - 17V Balanced. It is a small Xtant mono amp that has no built in crossover. Bridged Mono @ 4 Ohm 200. Number of Channels 2. Watts per Channel 4 Ohm 50. Watts per Channel 2 Ohm 100. Amp is in excellent condition. I am the original owner. Variable Bass Boost at 45 Hz 0-12dB. Continuously Variable 12dB/Oct High Pass Filter 40-120hz. Xtant has long been known as the pinnacle of quality in the car audio industry. All these features are encased in Xtant’s exclusive stainless steel housing . 4 Ohm RMS Power Output 2 x 75 1 x 150. 2 Ohm RMS Power Output 2 x 150 1 x 300.